8.1906: Launched by Goole Shipbuilding & Repairing Co Ltd, Goole (Yd.No.88) for Kelsall Brothers & Beeching Ltd, Hull (John E. A. Kelsall, London & George Beeching, Hull, managers) as COOT. 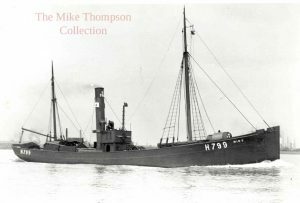 4.9.1906: Registered at Hull (H897). 11.1914: Requisitioned for war service as a minesweeper (2-12pdrs, 1-7.7” A/S Howitzer) (Ad. No.420). 3.1917: Fitted out to “Q” ship under names BURMAH, DORA, KIA ORA and LORNE (1-12pdr, 1-6pdr). Based Granton. 11.1918: Reverted to minesweeping role as COOT. Post 12.3.1919 (1920): Returned to owner at Hull (John Slater, London, manager). 1924: Transferred to Fleetwood (John Slater, London, manager). 6.3.1936: Kelsall Brothers & Beeching Ltd in voluntary liquidation. 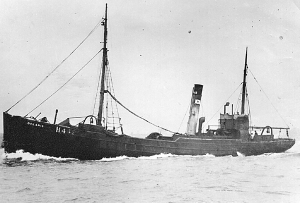 1936: Fleet sold en bloc to Heward Trawlers Ltd, London (R. S. Hewett & H. F. Hayward) (Robert S. Hewett, Fleetwood, manager). 1937: Laid up in Fleetwood. 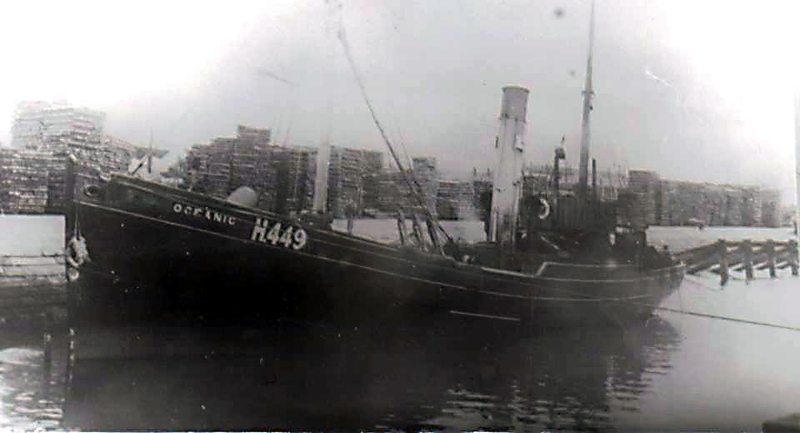 18.10.1937: Hull registry closed “Ceased fishing”. 5.1938: Sold to J. & E. Lumb, ?? for conversion to a private vessel. Renamed DORADE II. 1938: Fitted out as a private vessel by Nicholsons, Glasson Dock – 211g. 1938: Re-engined with twin diesel units 4 stroke 6-cyl 220bhp by National Gas & Oil Engines Ltd, Ashton-under-Lyne. 1.9.1939: Requisitioned for war service on examination service (P.No.4.340) (Hire rate £206.10.0d/month). Based Reykjavik, Iceland (Ty/Sk. J. F. Nuttall RNR). 2.10.1941: Compulsorily acquired by M.O.W.T. 27.9.1945: Sold to Major H. W. Hall. 1945: Fitted out as a research and survey vessel – 208g 113n. 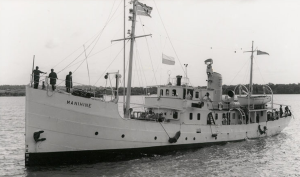 1946: Fitted out as a research and survey vessel. Renamed MANIHINE. 1955: Sold to Government of the Colony of Singapore, Singapore. 1961: Sold to East African Marine Fisheries Organisation, Zanzibar. 1964: Sold to East African Common Services Organisation, Mombasa . 1965: Managers became Southern Line Ltd, Mombasa. 1976: Sold to Institute of Marine Sciences, Zanzibar. 1978: Laid up in Zanzibar with no maintenance. 15.6.1979: Sold to ??,?? and used as a coaster on the East African coast. 198? : Laid up and abandoned at Dar es Salaam. The ship changed hands for One Pound in 1961 and sailed for East Africa to join the East African Marine Fisheries Organisation based in Zanzibar. Three years later ownership was transferred to the East African Common Services Organisation based in Kenya. In 1965, management and maintenance were undertaken by Southern Line and Southern Engineering at Mombasa until 1976 when the vessel was sold to the Institute of Marine Sciences and based in Zanzibar. During the course of its research program the ship ranged far and wide across the Indian Ocean, and at one time went in search of the fabled Coelacanth. Laid up in Zanzibar, the vessel became derelict and eventually grounded. In May 1979, the ship was put up for sale by tender the bids closing on 15 June. After an overhaul the ship returned to service as a coastal trader before being beached in Dar es Salaam. In 1992 the ship was deleted from Lloyds Register and demolition began soon after. The remains finally disappeared in 1997. 21/01/2009: Page published. 3 revisions since then. This entry was posted in Steam Trawlers, Steamers (Picture) and tagged Hewett Fishing Co, Kelsall Bros & Beeching Ltd on January 21, 2009 by Fred Smith. 25.5.1895: Launched by Edwards Bros, North Shields (Yd.No.503) for George Beeching, Fleetwood (managing owner) as MOULMEIN. 26.6.1895: Registered at Fleetwood (FD132). 30.3.1899: Registered at Hull (H61). 23.5.1913: George Clarkson appointed managing owner. 8.7.1913: Registered at Fleetwood (FD187). 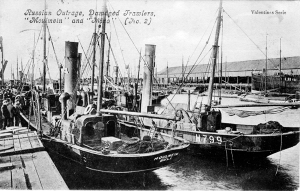 6.8.1913: Sold to The Devon Steam Trawling Co, Fleetwood (George Clarkson, manager). 1.1.1914: Tonnage altered to 59.04 net under provision of Merchant Shipping Act 1907. 18.11.1916: Sold to Henry Carl Smethurst (64/64), Grimsby. Henry Carl Smethurst designated managing owner. 18.12.1916: Registered at Grimsby (GY1007). 23.12.1916: Sold to Henry Carl Smethurst, John Wintringham Smethurst & William Winteringham Smethurst, all Grimsby (64/64 joint owners). John Wintringham Smethurst designated managing owner. 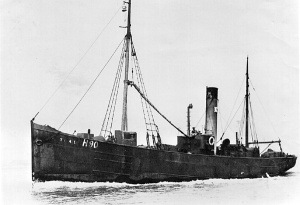 28.3.1917: Stopped by U-boat (UC77) with a shot across the bows whilst fishing 25 miles NE of Longstone Light and scuttled by opening seacocks and scuttles. Vessel position 56.00N 1.13W. 14.5.1917: Grimsby registry closed “Sunk by German submarine”. 19/01/2009: Page published. 9 updates since then. 18/09/2017: Removed FMHT watermark from image. 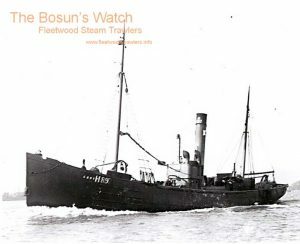 This entry was posted in Lost Vessels, Steam Trawlers, Steamers (Picture), War Losses and tagged Devon ST, George Clarkson (Fwd), Kelsall Bros & Beeching Ltd, Lost, War Loss on January 19, 2009 by Fred Smith. 3.1896: Completed by Thomas Charlton, Grimsby (Yd.No.26) for Richard Kelsall (64/64), Liverpool as OCEANIC. 18.3.1896: Registered at Grimsby (GY22). Richard Kelsall appointed manager. 1896: Sk. John Reader convicted on charges of fishing in the Minches with beam trawl and name and number hidden. 12.12.1896: Kelsall Brothers & Beeching Ltd formed. 23.1.1897: Sold to Kelsall Brothers & Beeching Ltd (64/64), Manchester. 2.2.1897: John E. A. Kelsall & George Beeching, Fleetwood appointed managers. 4.9.1897: Registered at Fleetwood (FD187). 13.4.1899: Registered at Hull (H449). 1.1.1914: Tonnage altered to 69.45net under provision of Merchant Shipping Act 1907. 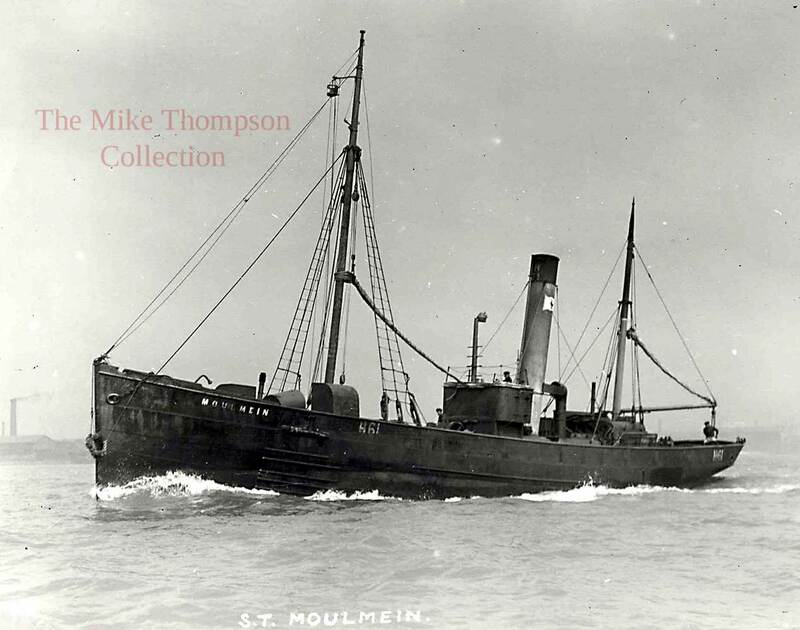 11.1914: Requisitioned for war service as a “Q” ship (1-12pdr) (Ad.No.391). 1915: Based Peterhead with Unit 41. 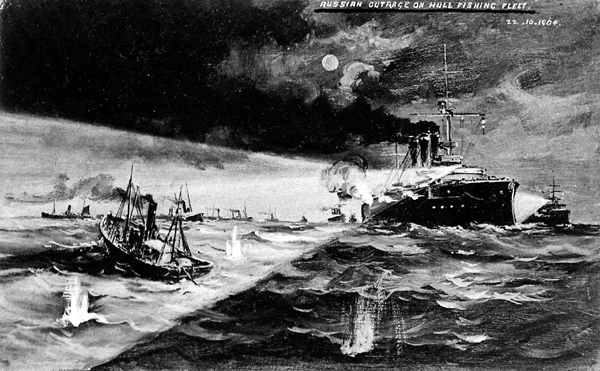 5.6.1915: Engaged and disabled a U-boat (U.14) by gunfire off Peterhead, which subsequently sank; one dead, twenty-seven survivors taken prisoner. 1.11.1915: Based Longhope with Unit 41. 9.1.1916: Based Malta with Unit 41. Based Aegean Sea. By 12.3.1919: Returned to owner at Hull. Reverted to OCEANIC (H449). 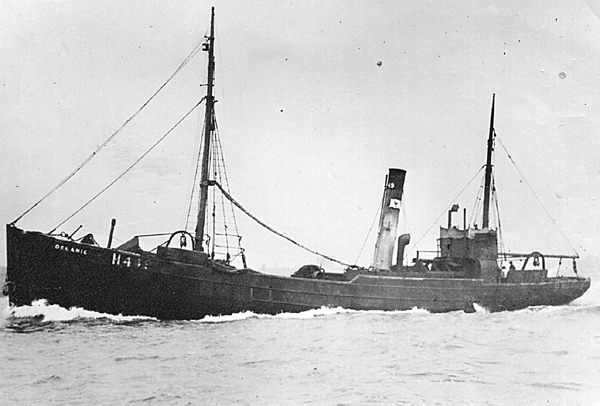 7.6.1919: Vessel mortgaged (64/64) to London County Westminster & Parr’s Bank Ltd, London (A). 5.1924: Sold for breaking up. 6.5.1924: Hull registry closed “Sold to Shipbreaker”. 18/01/2009: Page published. 6 updates since then. 17/09/2017: Removed FMHT watermarks from images. This entry was posted in Steam Trawlers, Steamers (Picture) and tagged Kelsall Bros & Beeching Ltd on January 18, 2009 by Fred Smith. 22.3.1897: Launched by Edwards Bros, North Shields (Yd.No.548) for Kelsall Brothers & Beeching Ltd, Manchester as TEAL. 5.5.1897: Registered at Fleetwood (FD166). 5.1897: Completed (John E. A. Kelsall & George Kelsall, Fleetwood, managers). 24.2.1898: Fishing off Dubh Heartach Light with other trawlers of the K&B fleet. 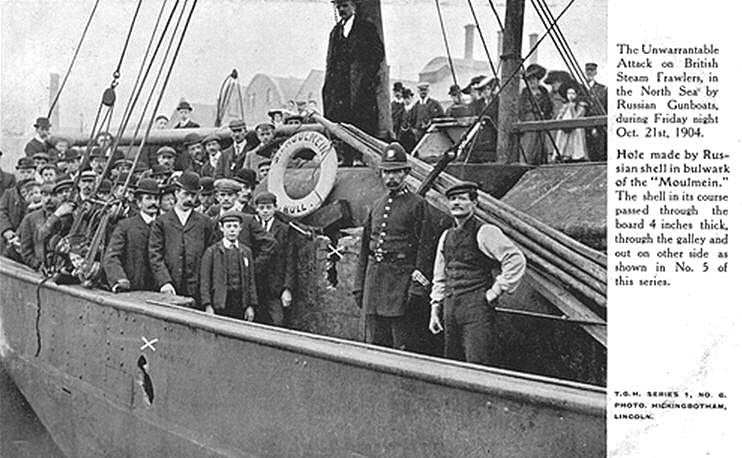 Picked up crew of PLOVER (FD173) run down in the early hours by Norwegian steamer SAINT ANDREW (2984g/) Manchester for Gothenburg which did not stop. Transferred survivors to fish carrier SWALLOW (FD167). 8.6.1898: In collision with steam trawler GERMANIC (FD185) which foundered after sustaining damage. 1899: Transferred to Hull. (John E. A. Kelsall, London & George Beeching, Hull, managers). 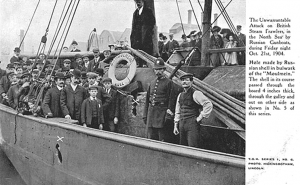 7.4.1899: Registered at Hull (H90). 19.7.1912: Re-measured after lengthening to 118.2 x20.5 x 10.8 ft 165g 64n. 19.7.1912: Hull registry closed and vessel registered anew in consequence of material alterations (H90). 11.1914: Requisitioned for war service as a minesweeper (1-6pdr) (Ad.No.418). 4.1915: Part of Unit 13 based Moray Firth. 2/3.1.1917: Went ashore over night near Buckie and became a total wreck. All crew saved. Gun and certain fittings removed. 06/09/2017: Removed FMHT watermark from image. 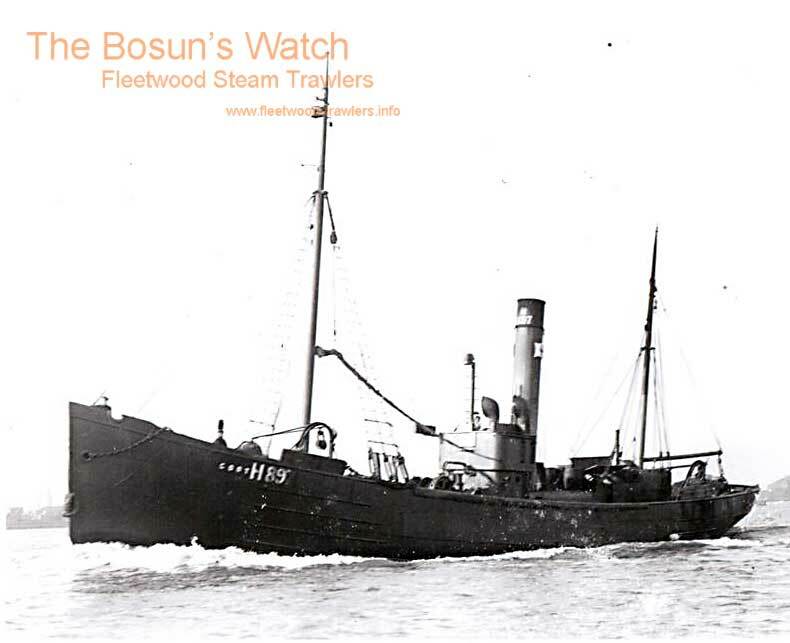 This entry was posted in Lost Vessels, Steam Trawlers, Steamers (Picture) and tagged Kelsall Bros & Beeching Ltd, Lost on January 18, 2009 by Fred Smith.